Taking away Republican legislators’ ability to muster enough votes to override the governor’s vetoes sets up a clash between Democratic Gov. Roy Cooper and the GOP-controlled General Assembly that could resound throughout the second half of his first term in office. This week voters replaced enough Republican incumbents to rob the House and possibly the Senate of the three-fifths majorities required to override vetoes. Unofficial results indicated House Democrats, who needed to pick up four seats, took nine. They also picked up the six seats they needed in the Senate. But Democrats were calling it a sweep that eliminated supermajorities in both chambers, crediting a campaign the state Democratic Party launched last year to accomplish that goal. Republicans have held supermajorities since 2013. 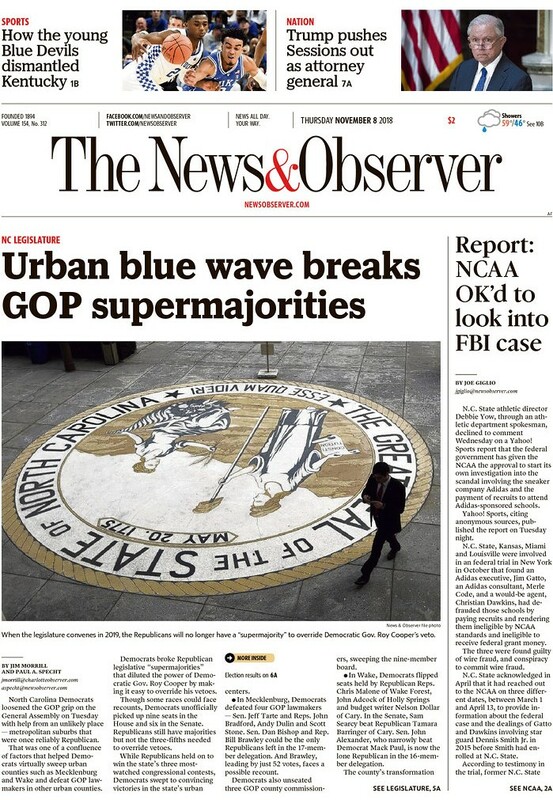 “By breaking the Republican supermajorities in both chambers of the legislature and by overwhelmingly rejecting the power grabbing constitutional amendments, North Carolinians sent a strong message to the legislature that they want their state leaders to find more common ground and work better with the Governor,” spokeswoman Sadie Weiner said in a statement the governor’s office released Wednesday. The shake-up changes the dynamic between Cooper and Republican lawmakers. Key legislators won’t be able to count on their bills or budgets becoming law despite opposition from Democratic lawmakers or the governor. 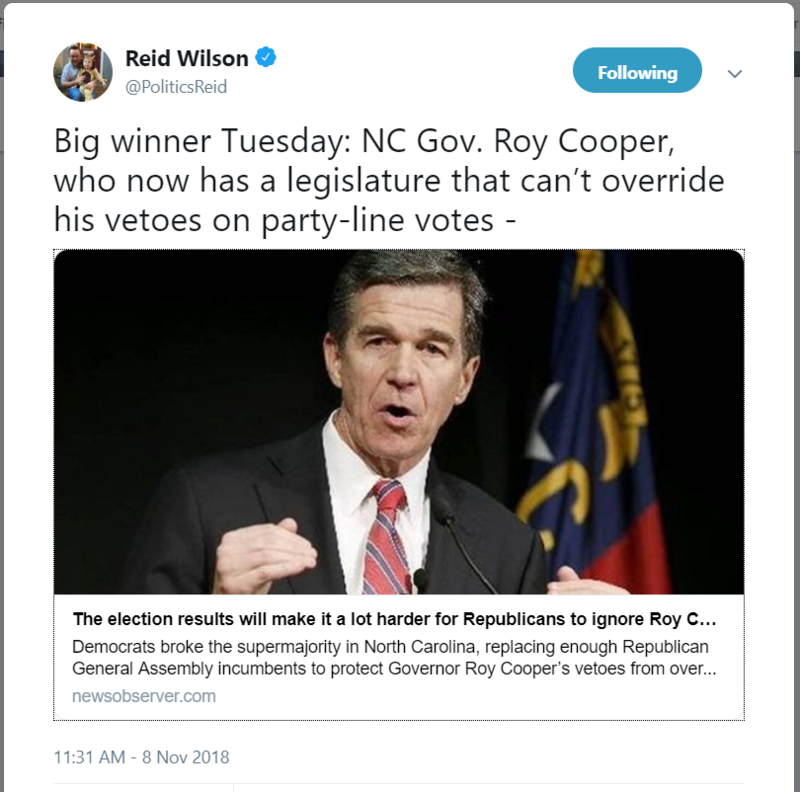 “They’ll now have to sit down with the governor and negotiate and discuss policy, something they have refused to do time and time and time again,” Morgan Jackson, a Democratic strategist who worked on Cooper’s campaign, said Wednesday. “The General Assembly not only fought him in these efforts but took him to court and passed legislation to limit his executive authority. Jackson said Cooper will continue to push for issues that he has promoted all along, such as expanding Medicaid and raising pay for teachers at all ranges of experience, as well as more disaster relief, a stronger emphasis on cleaning up water that is polluted with chemicals like GenX and from hurricanes. Chris Sinclair, a consultant who has worked in high-profile Republican campaigns in North Carolina, says there’s no doubt the outcome of the vote makes Cooper more relevant and will make it harder for Republicans to continue moving their conservative agenda forward. That will force them to become more strategic, he said.